Author: Screenplay by Leo Townsend, based on the radio play “Cabin B-13” written by John Dickson Carr. Leo Townsend was a prolific writer of TV episodes in the 1960s and apparently cut his teeth on adaptations like this one. John Dickson Carr, of course, is the Grand Master of the Locked Room Mystery, and his Wikipedia page found here will tell you all about him. Other Data: 75 minutes long. August, 1953, according to IMDB. Directed by Joseph M. Newman, a minor director whose best-known picture might have been 1955’s This Island Earth. This film was also remade in 1992 as Treacherous Crossing starring Lindsay Wagner, Grant Show, and Angie Dickinson. Cast: Jeanne Crain as attractive newlywed Ruth Bowman. Carl Betz as her not-very-much-seen husband, and Michael Rennie as the ship’s doctor attending their honeymoon cruise. Spoiler warning: I must announce at this point that the concepts I wanted to discuss about this film cannot be explored without revealing the ending of the film, and the twist that underlies some events. If you have not yet seen this film and wish your knowledge of it to remain blissfully undisturbed, stop reading now and accept my apologies. If you read beyond this point, you’re on your own. There’s not very much to this film, and there will not be very much to this review. I took note of this film because it’s one of the few times that the work of John Dickson Carr was made into a film. The Man With a Cloak (1951) and That Woman Opposite (1957), and the French-language La chambre ardente (1962) form the principal four. There was a television adaptation of Colonel March of Scotland Yard, starring Boris Karloff, and occasionally Carr’s stories were adapted for episodes of series without recurring characters. But by and large Carr’s work did not suit itself to the screen, large or small. Radio, however, was quite another matter. Carr’s short stories are often based on a single trick, and sometimes this trick can be ably communicated in a visual way that’s suited to radio. And when Carr came up with a radio script called “Cabin B-13”, he seemingly hit the jackpot. This was reworked and repurposed and remade a number of times, with a few differences each time, but all keeping the central premise. When I was much younger, I wanted to read my way through all of Carr and managed to do so, by and large, except for a few things. But “Cabin B-13” always defeated me because it had never been a short story or a novel, only a radio programme. I should probably have realized that because it had been repurposed into different media, it had to be a simple premise, nothing of the delightful (to me) complexity of, say, The Three Coffins. In fact, this is a simple story with a simple underlying premise. Jeanne Crain is a newlywed who boards a transatlantic liner with her new husband. They check into their stateroom and he promptly vanishes. She spends most of the rest of the film trying to convince people that, yes, she had a husband, he did come aboard, and she’s not crazy. She has discerned that some kind of plot is operating against her because a stewardess out-and-out lies about what happened when she saw the newlyweds in their cabin. The ship’s doctor, Michael Rennie, doesn’t quite know what’s going on but, in the way that films work, he has apparently fallen in love with her at first sight. One odd thing about this film is that the newly-minted Mrs. Bowman appears to fall in love with the doctor at first sight also. And that is weird, because she just met and fell in love with Mr. Bowman at first sight and was married after a whirlwind courtship of a mere few days. She’s not even completely sure where precisely she got married. If you look at this logically, there is something mentally wrong with this woman, and it’s not necessarily what everyone is thinking, that she’s invented a husband for herself and is engaged in some bizarre attention-getting behaviour. Carl Betz is pretty much a greasy little thug in a horrible suit, and Michael Rennie is sensitive, intelligent, and has wonderful manners. And he’s occasionally in naval uniform. What’s odd is not that Mrs. Bowman falls in love with the doctor at first sight, but that for all we know she has fallen in love with some random guy every six weeks or so for a long, long time. Carl Betz is not shown to be anyone with whom this pretty, well-dressed woman has anything in common. She certainly cares about her new husband enough to put herself through considerable anguish looking for him and trying to urge others to do the same. But the relationship between her and the doctor is … weird. It’s like they’ve known each other for years and the only thing left to do is tidy away the missing husband and run away together. And of course by the end of the movie you’re wondering about her sanity for having fallen in love with Mr. Bowman in the first place. Anyway. The stewardess looks guiltier and guiltier, but it’s not clear why, since our heroine has no idea who she is or why she would be inimical. Larger numbers of people start to think that Mrs. Bowman is crazy, and even the doctor seems to be being convinced. Then she gets a phone call from her husband. He’s aboard, he’s in hiding, and she has to keep her mouth shut about it, because danger and stuff. (This is a part of the film where your suspension of disbelief will be somewhat strained. It’s like the actors themselves don’t believe this particular part, and the screenplay has an air of “it is because we say so, so let’s move forward”. She’s relied crucially upon the assistance of the doctor, and all of a sudden she doesn’t trust him enough to give him a phone call and say, “Oh, BTW, found my husband, thanks so much.” This definitely has had-I-but-known aspects to it.) Anyway, it turns out that, surprise, her husband married her for her money. His plot is to make people think she’s crazy, came aboard alone with a hallucinated husband, and killed herself when her dementia really took over. Then the husband would run away with all her money to join, of all people, the stewardess, whose job has generated this whole scenario. So this is pretty much Gaslight on a ship. I think this worked for Carr in film, radio and print because the setting was a well-known cliche, and most of the plot could be carried in dialogue. There’s a big flaw in the way that this particular adaptation is presented, though. Since the screenplay makes it perfectly clear that the husband exists — she has conversations with him in public and no one makes a move to put her into care after watching her get kissed by the invisible man, as it were — we know she is not crazy, and the husband exists, and the stewardess is part of a plot against her. It’s apparent from the beginning that there is a plot against her, in fact. And so, since the big revelation in Act III is, yes, there IS a plot against her, all the life has been sucked out of that particular element already. Her husband is the ringleader? Um, well, yeah, since he’s the only person in the entire universe whom we know has anything to gain from her death. I have to say, this is about the least interesting work from John Dickson Carr I’ve ever encountered, unless you count the massive historical true-crime snorefest that is The Murder of Sir Edmund Godfrey. It doesn’t have any of Carr’s hallmarks, wonderful series characters or anything, indeed, except a straight line of plot, three main characters, three minor ones, and the backdrop of an ocean liner. (Carr set a couple of his books on board a ship, The Blind Barber and Murder in the Submarine Zone (aka Nine … and Death Makes Ten), and seemed to find the location innately interesting.) It’s noteworthy, though, that Carr never did manage to sell his great series characters in other media, unless you count simple audio-book readings and inexpensive radio-play productions of his printed works. Apparently Hollywood couldn’t handle presenting Dr. Fell — Sydney Greenstreet being the only actor who could have played him contemporaneously — and television was willing to settle for the relatively boring Colonel March. So we have this film, and a couple of adaptations of his non-series works. I suspect his mystery plots are too Byzantine for producers to feel that filmic audiences will grasp them at all, and his historical plots are — honestly, though I enjoy his work, they’re just nonsensical. It’s as though Carr specialized in “way too smart” but occasionally veered into “way too stupid”, and the few non-series contemporary novels are the only things that will translate to film as being “just right”. The acting is of a slightly higher quality. 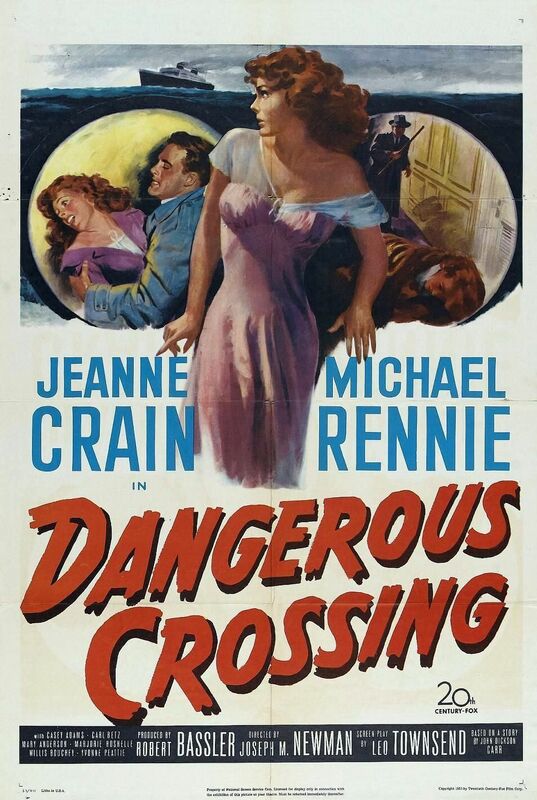 Jeanne Crain works very hard to sell the plot and does her difficult job well. Michael Rennie is painfully restrained and Carl Betz changes from Prince Charming to evil conspirator effectively. There are a couple of minor character actors who contribute a lot, particularly a tiny turn by Marjorie Hoshelle as a man-hungry female. Everything else is relatively undistinguished, although Crain’s character wears an incredible full-length mink coat that looks amazing even in black and white. Occasionally there are clever camera angles and interesting backdrops (the liner’s swimming pool is a nice period piece). But there is nothing here that lifts this film above the level of “programmer”, at a time when Hollywood was beginning to wake up to the imminent threat of television. Now, if they had made a film of The Judas Window … <sigh>. Copies of the film seem readily available. It was broadcast by Turner Classic Movies in August, 2013 and they aren’t usually shy about repeating their offerings every once in a while. This entry was posted in Detective fiction, Film, Multi-platform, Mystery, Mystery writers, Television and tagged Angie Dickinson, Boris Karloff, Carl Betz, Gaslight, Grant Show, had I but known, Jeanne Crain, John Dickson Carr, Joseph M. Newman, Leo Townsend, Lindsay Wagner, Marjorie Hoshelle, Michael Rennie, Sydney Greenstreet.